As with everything else in this online manual, we provide different perspectives and experiences because there isn't a 'one right way' to do anything: we're broadly aiming towards re-wilding if we're doing integral permaculture, and there are very many steps to get there, and lots of kinds of people making countless experiments - here are just a few we can learn from. Depending on what your situation and resources are, if you are going to eat pork anyway, any kind of raising pigs at home is better than buying the meat (and supporting) the industrial farming complex, so start wherever you can, and / or support organic farmers in your locality at whatever stage they're at. Josh describes how pigs help us in transforming forest to gardens. This is a beautifully presented 4 part documentary on making traditional, delicious and sustainable use of the whole pig, see page with videos here & the Butcher's Salt series here. 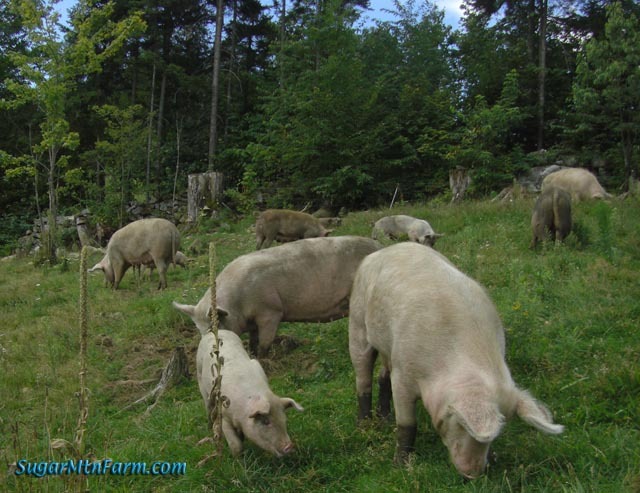 For good information and many articles on different topics on how to raise purely pastured pigs (without any grain feed) see the website of Sugar Mountain Farm. > see good description of the harvesting & economics, as well as how they dealt with all the usual emotional & ethics dilemmas vegetarians face when transiting to a sustainable diet. Taiga and I have undertaken a project to raise three pigs for meat this summer. And today is the Pig Roast that we are throwing for over 100 people. With meat that has been raised in a humane way in very short supply, my sweetie Taiga and I decided that we would experiment with growing three pigs this summer. We have been for some time now on a mostly vegetarian diet after deciding that we would try to eat only meat that we knew was grown in a humane way. Our challenge with this project is to see if we can truly raise our pigs in a humane way, caring for them and giving them a great, albeit short, life with (as Joel Salatin says) "one bad day." We got the little porkers when they were only 25 pounds each, back in May of this year. In just 4.5 months these pigs grew to over 200 pounds. At this moment, only one out of the three remains in the pen, and Prosciutto weighs in at nearly 250 pounds. So, how has it gone with the slaughtering and the butchering of the last two pigs? After realizing that we were going to have too much meat to know what to do with, we decided that it would make more sense to slaughter one of the pigs early, at the beginning of September, so that we would have ham, bacon, roasts, pork chops, and other such enjoyments throughout the month of September. We have had that, and quite a bit has gone into the freezer as well. So we called up Derek. Derek is the local small farmers' butcher. After doing a four month apprenticeship at a butcher in New York, Derek came back to Teton County to set up his small business. At any given time he seems to have a couple lamb, a couple pigs and a dear hanging in his wolk in fridge. Derek makes a living helping small farmers like ourselves "do the dirty work." And he returns an amazing beautiful and tasty product. So at 6:30am on Sunday morning, we awoke and put on our dirty clothes. I have to admit I was a bit nervous and a little bit sad for Outlaw, who was the chosen pig to have her "one bad day." Outlaw had been our favorite pig. She was the only one with prominent black markings on her body, and seemed the most likely to come up to be scrathed. She would also be the one that got the most frisky in the evening and would instigate a squeel and run playtime in the pig peg, where all three pigs would run around in the big clumsy way. Quite funny. Derek showed up right on time, and while we were trying to isolate Outlaw in a good hearted attempt to not have the other pigs witness her killing the other two pigs broke out of the pen. So just as the tension was building, we had to chase the pigs around sing "Day-oh Me Say Day-ay-ay Oh, Day Light Come and We Want to Go Home." (Which of course is the Pig call that we chose to use with our pigs, and generally works.) This morning, the call, and temping them with a bucket of food didn't work very well. Delicious went stright to our neighbors tree farm, where the sprinklers keep the grass nice and green. She wanted to root around in there a bit, and Prosciutto made a B-line for the veggie garden. With a little big of persuasion (and a big of embarrassment on my part in front of Derek), we go them back in the pen. Derek told us that usually the pigs aren't separated and that it would be fne to do the deed right there in the Pen. So we enticed the pigs to a spot that was easily accessible by Derek, with his 22 and gave them some food. Out law looked about as happy as a pig could be, Face down in the slop, occasionally looking up with a large mouthful of pasta or bread that she was enjoying. One of these times that she looked up, POP! A 22 bullet (which was surprisingly not loud at all) was shot right into her forehead. She immediately was stunned, fell to the ground, and her nerves started kicking in. At this point, as we were told later, the pig is not dead, but is completely unconscious and nerves cause the muscles of the animal to kick quite wildly for about two minutes. Right away, after shooting her, Derek grabbed his fillet knife, and got in there to cut the major arteries in her neck. This would be what actually kills the pig. He made a rough attempt to hold back her kicking legs, while he jabbed the fillet knife in to her breast bone, and pulled it up toward the chin. I think he made two or three jabs like this and the blood came pouring out. With the animal still kicking it made quite a mess, spilling a couple gallons of blood into the earth of the pen. After about 2 minutes, the carcass (I don't think of it as Outlaw anymore. Outlaw is gone. RIP.) stopped kicking. As quickly as we could, we pulled it onto a tarp and over to Taiga's shed, where we hoisted her up on a pulley. It is important at this point to work somewhat quickly to clean the animal and get it into the refridgerator as soon as possible. A dead weight 220 pound pig is not easy to move around, so we actually used a rope tied to Dereks truck to hoist the carcass up. A slit the the achilles of each leg where a rod of somekind went through, was able to hold her weight. With her hind legs lifted and her head down, she had a length of over 5 feet! I won't go into to much detail about taking the guts out, but this was a pretty interesting biology lesson. There is a lot there. It is incredible. Using a fillet knife and a butchers hack saw, Derek was able to get the carcass into two halves, looking much more like meat now than an animal, in a little under an hour. We hoisted the halves into his truck, and went down to his butcher kitchen, and hung them up in a walk in fridge. It is important to hang the meat for a few days to let the meat firm up a big before butchering it into the various cuts. Out of the stomach cavity, I kept the heart, and that day for lunch, I sliced it into thin slices and made a stir-fry out of it. Heart has a distinct taste that is very different from the Pork of the muscles, but it was still quite good. Taiga ate some, but decided not to go back for seconds, and I have to admit that it certainly didn't entice my taste buds like bacon or pork chops would. The killing was certainly not fun, but it was interesting, and I felt okay about it. I do feel that Outlaw didn't feel a moment of fear, suffering or sadness. One moment she was munching on some of her favorite foods, looking as happy as could be, and the next, she waw totally unconscious. The nerves kicking like they did was a little disturbing, especially once the throat was cut open, as then there was blood being thrown about, but after that was done, she seemed totally at peace. In fact, I believe everthing that was the being Outlaw, was gone by that time. (To where, I have no idea, but possibly Hog Heaven, where the streams flow with beer, the fresh watermelon is always pre-cut, and the Italian Restaurant Slop never stops being served). By now, we have slaughtered two out of the three pigs. On this last one, I kept the liver as well, and made pork liver pate (which Taiga's Aunt and Uncle report is actually very good). Again, liver has a very distinct flavor that is different from other meat, and it took a fair amount of spices, and culinary sauve to turn it into something you want to come back for! But it actually turned out quite nice, and I plan to serve it today at the pig roast as an hors d' oeuvre. We have eaten a couple pork chops, a couple of the roasts cooked in various fashions and a number of strips o bacon (we get our firsh 10 pounds of sausage delivered today). In every case, we eat with full awareness of how wonderful it tastes. The meat that was produced off these animals is of the highest quality, and to sit down and eat something that we grew ourselves has a quality to it that cannot be approached by buying something at the store. Incredible. I believe once a person experiences growing their own food, be it meat or veggies, it is tough to go back to fully enjoying store bought, mass-produced food. There is so much more QUALITY to the experience of eating your own home grown food. So much more enjoyment, appreciation, and attention giving to every bite. $30 = materials for building the pen (we got most of them from a neighbor who used to run a junk yard. $216 = 12 bags of grain at $18 per bag (we needed to buy grain to supplement their feed, especially when someone else was feeding them, or when Pete had a number of days off from the restaurant. FREE = Pete and Sarah each work at restaurants and probably brought home over $1000 worth of slop to feed the pigs, plus we got tons of produce from the local Grocery Store. $1056 Total or $352 each (120 pounds of meat, comes to almost exactly $3.00 a pound). These economics show how hard it would be to be a small farmer and be able to sell your product at a "fair price." If we had to pay for all of the food ourselves, this pork would have been more than double the above price, maybe even three times the price, meaning if we were trying to make a living from it, we would have to sell the meat for $15 a pound, which I would imagine would be very difficult to do! Overall, its clear to us, if we don't have a free source for food, it wouldn't work for us to raise the pigs again. *we did get lots of "waste food" from the grocery store. Much of this was the kind of food that was easily eaten by us, not just the pigs. Like apples that have one small bruise, or guacamole, which just reached its expiry date that day. This kind of food is often called "Pre-dumpstered" food, and the amount of savings in money spent from that is definitely in the multiple hundreds of dollars, so if we count that in, it helps the economics look a little better. Quite a bounty. We figure that a pig with a standing weight of 250 pounds has a hanging weight of about 200 pounds, and that is probably 150 pounds of meat. Some things you need to know about pigs, in this entertaining story by Dan Barber who is Chef/Owner, Blue Hill & Blue Hill at Stone Barns and Creative Director, Stone Barns Center for Food and Agriculture, on carrots and castration. Extravagant Deliciousness is how to describe the meat from raising a small pig to feed your family. Check our Brandon at Farmsteadmeatsmith.com for phenomenally beautiful videos about his butchering process.